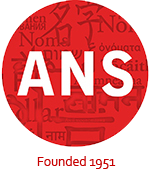 During the January 2015 annual meeting in Portland, Oregon, I had the honor of accepting the nomination to become the new President of the ANS. Within this capacity, I have set many goals. Chief among them is doing everything within my power to improve the services which ANS members receive, increase the public visibility of our society, and support the onomastic research community. With those goals in mind, please feel free to contact me anytime, should you have any questions, suggestions, complaints, difficulties, or requests. The ANS is your Society. Your voice, your perspective, your thoughts, and your ideas are important! For those of you whom I have not yet had the opportunity to meet, I sincerely hope that we will have the chance to have a chat during one of the many ANS events this year or the next. For those of you whom I have already had the good fortune of working with, may I take this opportunity to thank you for your incredible support, creativity, and inspiration. The ANS is not simply a scientific society. It is a very special community ―one which I am enormously honored to be a part. May this year bring each one of you new inspiration, good health, and many unexpected moments of peace and wonder.